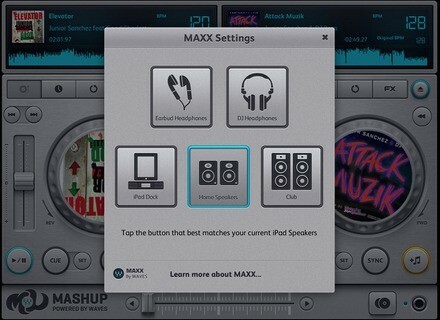 Mashup, Other software for iPhone / iPod Touch / iPad from Waves. Waves Audio joined forces with Musicsoft Arts to introduce Mashup, a new iPad app. Featuring a playback engine and effects, Mashup lets users play and mix directly from their iPad music library – plus download tracks from DJs like Junior Sanchez and Kris Menace. Mashup is a mobile DJ booth, with EQ and analog-style resonant filters, Vinyl Touch scratching, and independent time-stretch and pitch-shift for each of its two stereo decks. Users can also use Waves MaxxAudio enhancement, available at an additional charge. MaxxAudio for Mashup includes MaxxVolume dynamics control, which is designed to increase the output levels of headphones and external speakers; MaxxBass psycho-acoustic bass enhancement; and preset sound modes for earbuds, headphones, docking stations, home stereos and club systems. The Mashup app from Waves Audio and Musicsoft Arts will be available Q1 2012 from the iTunes store with pricing to be announced. For more information, visit www.waves.com. [NAMM] Open Labs Music OS 3.1 Music OS 3.1 features technical and social updates. [NAMM] Samson Carbon 49 The Carbon 49 offers players a semi-weighted keyboard with 49 velocity-sensitive keys. [NAMM] Samson Graphite 49 The Graphite 49’s semi-weighted keyboard is designed to feel more like an instrument than a controller.